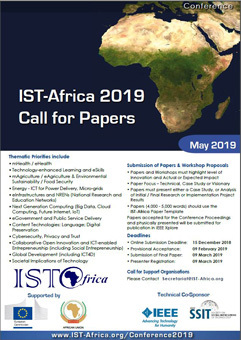 The IST-Africa Call for Papers is focused on full papers (8 pages, c.4,000 - 5,000 words). Please download the IST-Africa Template and Paper Guidelines by right-clicking on the links and use Save Target As. It is necessary for the template to be saved on as a separate .dot file on your harddrive. Then click on this template in Windows Explorer (or another file manager) to create a Word document using the template styles. When you save the document it should have a .doc extension. All authors must comply with the template and associated guidelines for papers in order to ensure consistency across the conference proceedings. Papers must present analysis of initial or final research results or a case study. It is important to highlight actual or expected impact as well as the level of innovation. Any visionary elements in paper should be supported by mini use cases to illustrate applicability. General project descriptions are not appropriate. Any elements of the paper previously published should be carefully referenced. It is necessary for papers submitted to include new elements that have not previously been published to warrant inclusion in the conference proceedings. As all papers will be double blind peer reviewed by the IST-Africa 2019 Programme Committee, please ensure that no contact details are provided within the text or Properties of the paper submitted. All contact details will be submitted online as part of the Submission Process. Papers should be uploaded in .doc format.